The design for the world’s greenest cruise ship has been finalised and its maiden voyage will be in 2020. The Peace Boat Ecoship Project is a new vision and a message for a global culture of peace and sustainability. The Ecoship project is a transformational programme to construct the planet’s most environmentally sustainable cruise ship. A vessel that will deliver for its passengers a unique programme of activities centred on experiential learning, intercultural communication and travel around the world. The Ecoship is not merely a vessel for travel: It is a floating ecosystem with a multi-generational on-board community, living in a unique environment. A lush on-board garden serves as the heart and the lungs of the ship, featuring plants from around the world fed by rainwater and organic waste and providing fresh air, beauty, comfort and produce that the whole ship can enjoy. The Ecoship will feature a microscale combined heat and power generation system and an advanced, low consumption HVAC system using waste energy from the main engines, maximising the use of waste energy re-use through exhaust gas boilers, auxiliary turbo generators and an additional steam generator system. A closed-loop water use system ensures that wastewater is reused, purified and re-purposed, along with rain and seawater, for irrigating the on-board garden. The Ecoship redefines “clean”, promising zero water discharge, zero NOx and SOx emissions, a 40% reduction in CO2 emissions*, and no sea dumping. 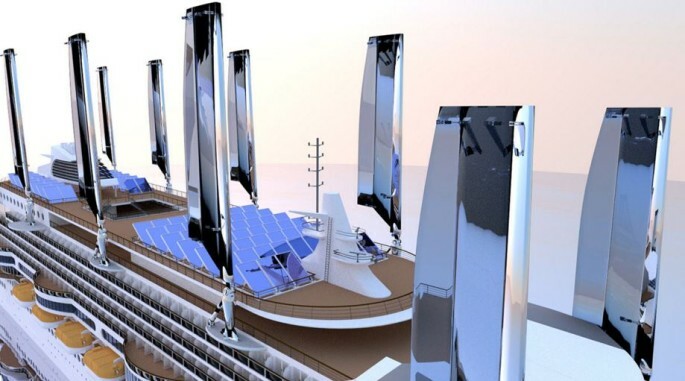 The concept of Ecoship represents a radical shift in the way we address our energy needs. Unlike even the current best in market, the Ecoship aims to meet its core hotel and propulsion energy needs with renewable energy, including a future-ready engine able to adapt to bio-fuels and using LNG as a top-up energy source. 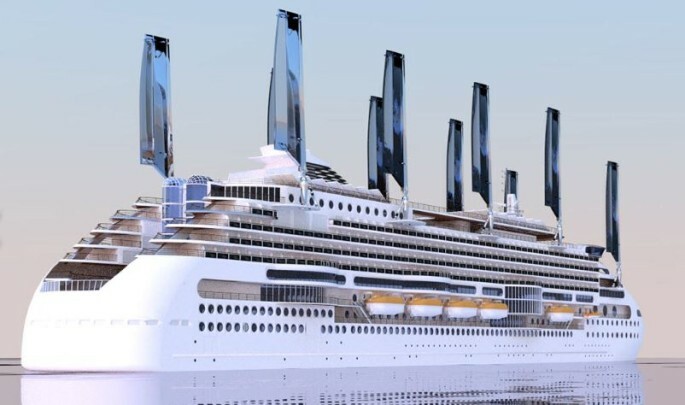 The Ecoship will be the world’s first 10-mast cruise liner and will harness the energy of the wind, reducing propulsion fuel needs, in optimal conditions. In low wind conditions, the solar panel-covered sails and 6000m2 top-deck solar farm will continue to generate over 740 Kw of power. The Ecoship will also use biofuel and even kitchen waste as alternative fuel sources. Peace Boat is a unique social business that combines the four pillars of Education, Business, Advocacy, and Travel. The global voyages offer a unique programme of activities centered on experiential learning and intercultural communication and the income generated is channeled into future voyages as well as all of the NGO’s activities to promote peace, human rights and respect for the environment. Peace Boat began sailing in 1983, and today sails for 80-100 day global voyages three times every year, carrying approximately 1000 passengers per voyage.